Use a Lace Board for ease in preparing lace for stitching. Although not necessary, a lace board is handy when gathering lace to fit the entredeux. I am pulling two threads in the lace heading to gather the lace. 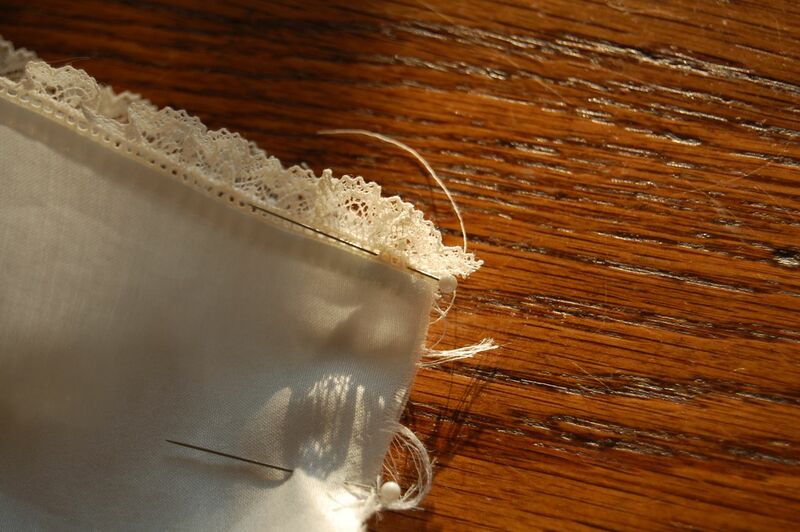 Today, we are going to begin our Lesson with attaching Lace Edging to the Entredeux. The lace edging will be attached at the Neck and the Sleeves. We have already attached the entredeux. Here are examples of lace edging attached to entredeux at the neck. 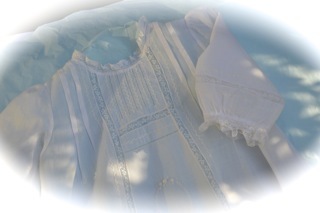 The lace is gathered on the white Daygown. 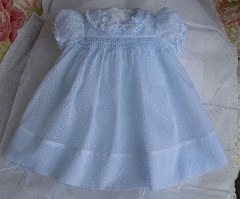 The lace is attached without gathering on the blue daygown. You can gather the lace at the neck and sleeves or you can leave it ungathered. For a boy, either is acceptable but it is more tailored if the lace is left ungathered. 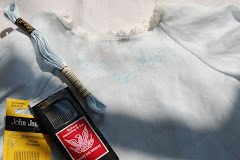 Go to Step 4 in your pattern instructions for View 2 of Embroidered Raglan Daygowns to read about attaching lace to entredeux at the neck edge. 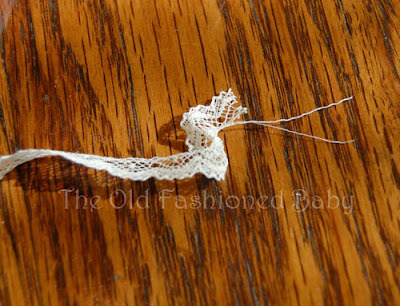 Cut the lace the length it states, then go to my Gathering Lace Post for more detailed instructions. Read the entire post for clarification and stitch the lace to entredeux following the pattern instructions. 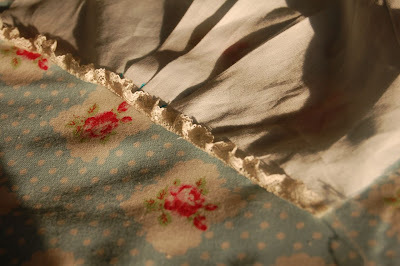 Gathered lace edging sewn to the entredeux on the sleeve. Lace to entredeux - sew it right sides together. 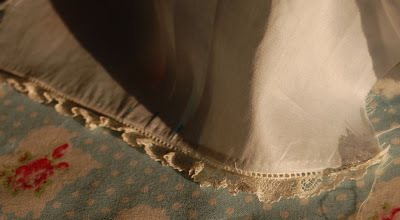 Lace is pressed away from the sleeve. Lace to entredeux - Done!! 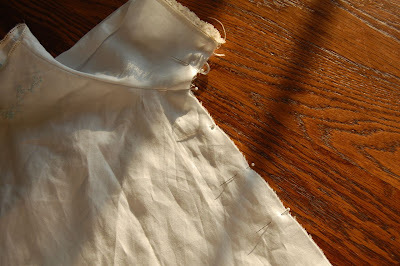 Sew the side seams in a French Seam. Be sure to match the sleeve edge. I stick a pin through the entredeux to keep it from shifting. 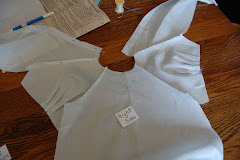 Match the sleeve edges, then match the underarm seams of Front and Back, then match the lower edge. Stitch a pretty little French Seam. Now, you will have completed stitching all the lace to the Daygown and finished the side seams in a French Seam. You are almost done!! Hope you have kept up! 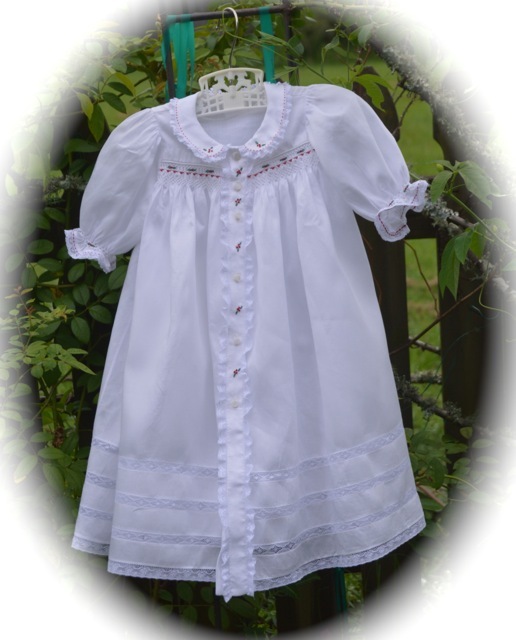 Question for the Lesson - Did you embroider the top and bottom of the daygown or only the top? Do you enjoy Embroidery? Tea Time in my Sewing Room today! Chocolate Chip Scones (and today, I remembered the Almonds!). And a cup of hot Earl Grey tea. Perfect! Oil of Bergamot, derived from a citrus fruit, is the secret fragrance of this tea. Many of you have asked for Recipes. 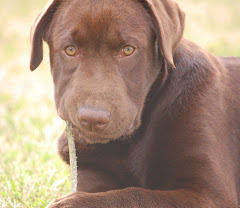 I will get them up one day this week. The scones look great. Wish I had one right now. I did the neck embroidery but had some extra time last night so started on the bottom but only got a couple of flowers done. It's coming along nicely. I love doing it by hand. I've done all the embroidery on the gown, done embroidery for 35 yrs. Love doing embroidery only second to smocking. I'm going to change the lace edge to a crocheted lace edge. Tried that once before and it turned out so pretty, I wanted to do it again. I've hand stitched on lace before and wanted to do something a little different. 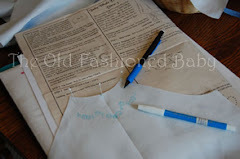 I've had such fun doing this Sew-A-Long! I'm sure you love hearing that and I hope you do another some time. I will definitely join in. I finished the top and started on the bottom embroidery. I embroidered the top and bottom of the daygown. This has really been fun. Can't wait to finish and start the next one!! 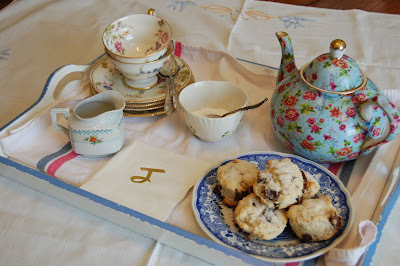 Thanks for the scones and tea! I have embroidered the top and the bottom of both my daygowns. I love to embroidery and have been doing it for about 1 1/2 now! Chocolate Chip scones are MY favorite!!! I've started on the top and plan to do the bottom as well. 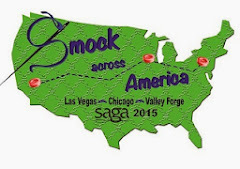 I love this sew-along and hope that you will consider doing another. I love that we have a week to finish one lesson. I plan on starting another daygown when I finish the current one. I love the hand sewing! I have completed all of the embroidery and enjoyed it quite a bit. I have done embroidery before but admit that I enjoy it more when it is applied to garments. I know it says Jerome said, however, Jerome is not doing the stitching, I, Marie am. 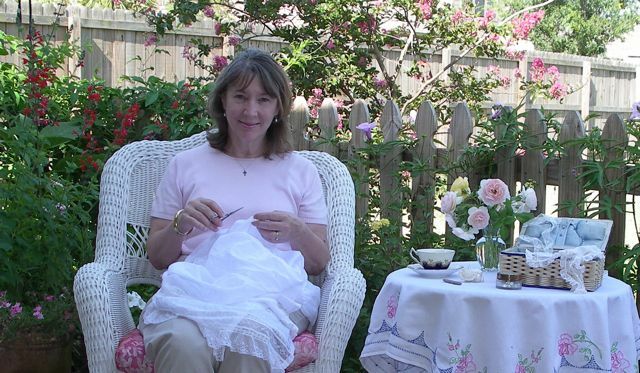 I hope you do another sew along. I embroidered both the top and bottom. Hand embroidery was my introduction to needlework many years ago, and I still love it. 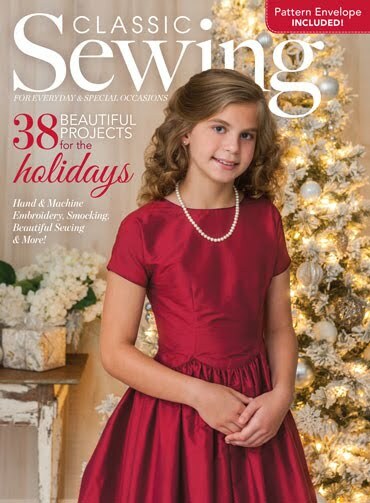 I too hope you will consider doing another sew along. I can't wait for the recipe so I can try your yummy scones...Thanks so much! I embroidered the top and bottom of the daygown...I think it turned out ok. I feel I need to do more embroidery in order to feel more comfortable with my results, but I like doing it.lol. These are so pretty! I love them! You are so talented. Thanks for sharing your knowledge so generously! Jeannie...I am not quite finished yet but I plan to do the top and bottom. I LOVE hand embroidery. For me it is therapeutic!!! I have embroidered the top and am working on the bottom. I hope to finish soon and attach the lace ASAP as I am 8 1/2 months pregnant and really want to finish before the baby gets here! I'm going to do the top and bottom embroidery. I've had a very busy week, so I'm only a little more than half done with the bottom pattern, but I'm getting there...I love to embroider. The embroidery is my favorite part so I am doing the top and bottom. 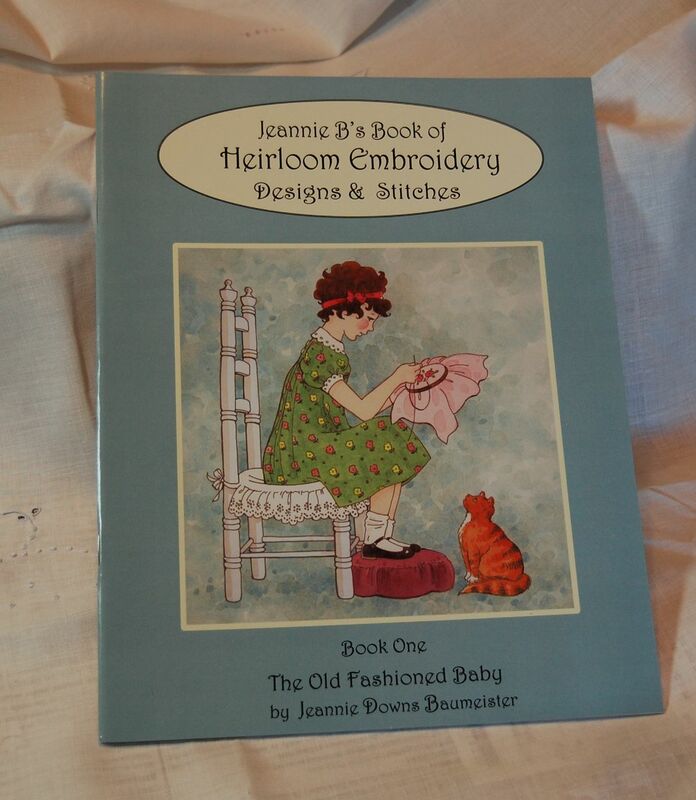 I hope you do another sew along soon - I am having a wonderful time with this! I love embroidery, so when I catch up it will be both at the top and on the lower edge. It's what turns these delicate clothes into sweet confections! Finally caught up on the embroidery this morning; back to school this week really kept me hopping! Now, I can continue with this week's lesson. I'm so excited to finish next week! Can't wait to get pictures of my little guy in his hand-sewn gown. Thanks again! Looking forward to trying some of your yummy recipes, too! It's a good thing I've been enjoying them "virtually" or I would have gained 5 lbs. with this Sew Along!! 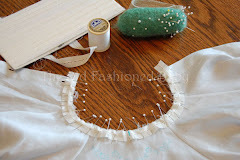 The daygown I am working on has embroidery top and bottom, using the ecru Maderia silk floss on an ivory batiste.. I just finished attaching the lace and noticed that the entredeux extended more than 1/4". What should the finished neck measurement be? Mine is around 11" and when I reread lesson 5 and the instructions in the patter, I think it's supposed to be closer to 12". 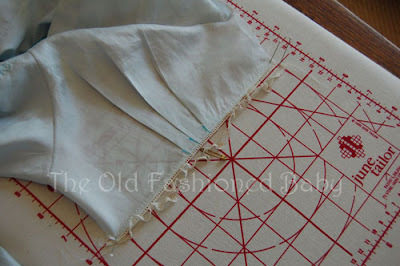 This information is in Lesson 4, you will click on attaching entredeux to fabric. You are right that the pattern instructions tell you the neck measurement is 12". This is large for most infants, so your neck will still fit a Newborn. 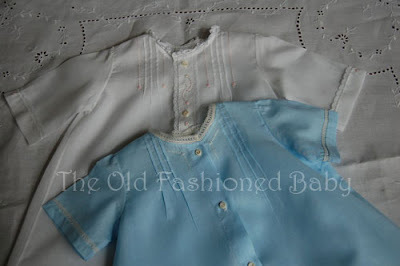 If necessary, you can stitch the buttons closer to the edge of the back facing , which will give the baby more neck room. I have done the embroidery at the neck and on the bottom. This little gown is going to be so precious! Thank you for all of the time it has taken you to do this for us and for the wonderful pictures and instructions. Since I got out order on mine and started my embroidery back on Lesson Two I did the top and bottom both. Had plenty of time for stitching in the carpool line. 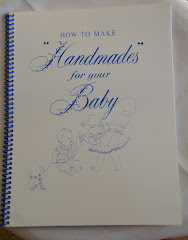 I don't normally enjoy handwork but I am beginning to since doing this lesson. Have enjoyed this week by week. Thank you Jeannie. I'm still lagging behind, but I am going to embroider both the top and the bottom, using white Presencia floss on pink Japanese lawn. (I have only managed 3 flowers and a sprig on the bottom so far.) I LOVE hand embroidery--as soon as I pick up a needle I can literally feel the endorphins flowing though my veins, lol. I was out of town in Alabama for Labor Day weekend and tried to post but I guess didn't go through. I embroidered top and botton and did white on white. I love that my daygown will have a little history about travel with making it.